east side bride: For the wedding reunion??? 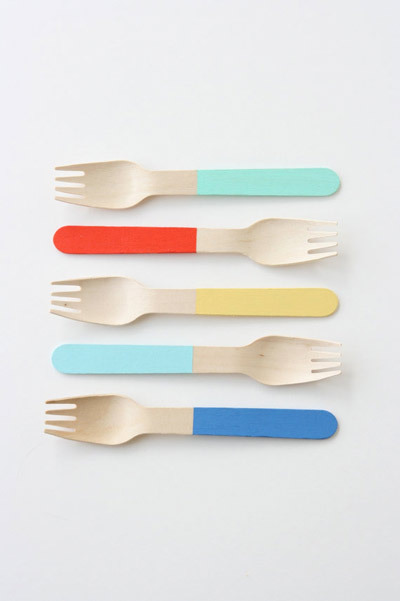 The first time around, I was obsesses (OB-SESSED) with finding wooden forks for our rehearsal picnic. I don't actually even remember if we found them. I think we found them. Anyhoo. How cute are these painted babies from Petit Moulin? my first thought was too close to the glittery cutlery. also...why wedding reunion? It's an anniversary party, right? I don't think it's the same AT ALL but will admit that it's the first thing I thought of. Wooden cutlery is hella expensive. I thought about buying it for my camp wedding (instead of using the crappo camp melamine plates and beat-up silverware) and decided it wasn't worth it. Plus, we had to serve 5 meals over the weekend. I really want to hear more about the wedding reunion. If we had an anniversary party at the same place we got married at, I'd call it that, too. what kat t. said! but they're way better & i still love ya. you should also check out the "sucre shop" on etsy. srsly cute. if australia has them, there will definitely be someone in california that has them! maybe just google biodegradable cutlery?